When it is time to modernize your bathroom space, custom glass shower doors can deliver the feeling of a resort right in your home. House of Glass works with homeowners, builders, contractors and architects to create an amazing bathroom experience. A custom glass enclosure can help show off details such as title and hardware creating a luxurious feel. For more than 30 years, House of Glass has been creating, installing and repairing functional yet beautiful glass shower doors that transform eye soars into a home’s focal point. Call us now at 973-674-4228 to discuss how we can help you. Frameless shower doors – attractive and popular option held in place by simple metal hinges. 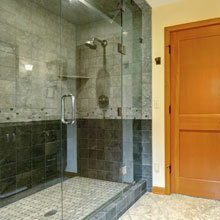 Sliding glass shower doors – compact and great to use when space is limited. Framed shower doors – offers a variety of styles and prices. Custom shower doors – get a door that fits the exact dimensions of your space. Heavy glass enclosures – excellent structural integrity and durability for frameless glass enclosure. With decades of experience and a fully equipped shop right here in Essex County, we are able to craft a custom glass shower enclosure to your exact specifications. Why a Custom Glass Shower? There is no one size fits all when in comes to your bathroom space. We can create a custom enclosure that matches the exact dimensions for your room. As experienced shower door installers, we can help you decide the right product for the amount of room you have. Smaller rooms may require a sliding door while larger areas may be perfect for a hinged glass door. If you already purchased an off the shelf product, don’t worry. We can still help you install it properly so it functions well for years. And, if you ever need repairs House of Glass is only a phone call away. Are you ready to repair or replace your bathroom’s shower doors? House of Glass has more than 30 years of experience with all types of glass door installations. Our costs are competitive and skill unequalled. Contact House of Glass today at 973-674-4228 for a free quote.